LocalUp is a joint event between Moz Local and LocalU.org. There isn’t a better local search marketing focused event in existence. I couldn’t resist and headed up to Seattle from Tampa last Saturday for an incredible, knowledge-packed 14 hours (5 hours of after party). This weekly is 3 audit tips based on the knowledge bombs delivered there. Don’t play local. Be local. Google’s focus is mobile first. Ads are a big deal. Don’t try to just game the system. Be a local hero. All new features brought to Google’s search result pages are adapted from what was tested on mobile first. A common look and feel to all products is always the best brand strategy. AdWords are finding their way into almost all search result pages and often have the majority of real estate. This isn’t such a bad thing, as Joy Hawkins points out this week in her post on Imprezzio Marketing’s blog, AdWords are a good thing. Finally, as was a common theme in almost all the speakers’ presentations: provide useful services and information to your local market and you’ll succeed. 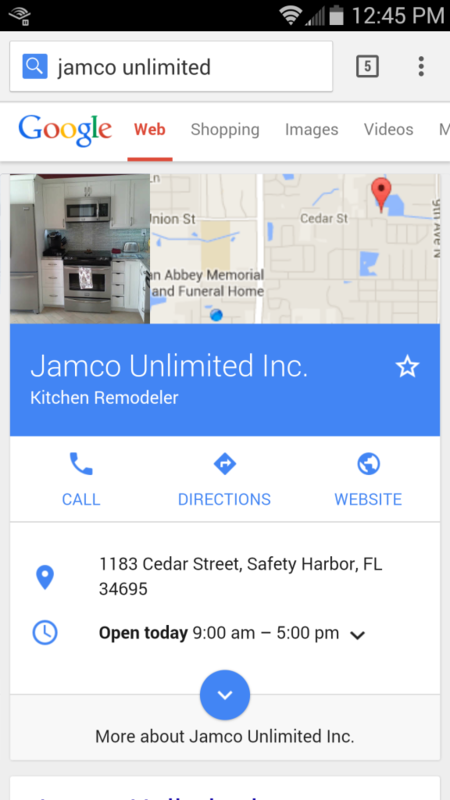 Audit Action: Search your business name from a phone using Google. You should definitely see something like below. If not, reply and let me know. Just a brief note here. It’s difficult to get help from respectable Local SEO practitioners on virtual offices. This is for good reason. For almost a decade, spammy business owners and SEO agencies would rent PO boxes and addresses at office buildings in order to get a pin marker on Google Maps. This affected search rankings in their favor. Well the intention of a location on Google Maps is to have an address for people to visit. Within the past 2 years, great measures have been taken by Google and the community to cut down on this. Now, there are legitimate use-cases for having a virtual office. Therefore Google does still allow it. There are guidelines for this, but I won’t reference it, because it’ll likely change again soon. It’s simple though. If you have a home office only, but would like to meet clients in a professional, private setting (not Starbucks), then renting some office space on an as-needed basis, then by all means do so, and use its address as your business address. DO NOT, get a virtual office to alter search results. You’ll waste your money. DO NOT, get a virtual office and create another business listing on Google. One listing per business. Audit Action: Review the Google My Business guidelines on address. Let me know if you have any questions. The beauty of local search marketing is you have a fighting chance against large brands with large budgets. Forget TV and billboards. Just be someone who cares about the community (because you live and work there), and the leads will follow. I say “fighting” chance because you do have to fight. And in fight, I mean war. And in war, I mean you need a strategy. Small local paper ads, community newsletters, door hangers, vehicle wraps, community events, sponsorships… all great tactics. However, they’re ineffective if not implemented with a strategy. Audit Action: Take a look at your website, Facebook page, business card, flyers, etc. Is the logo the same? Is the message the same? Is the target audience confused who you are? That’s it for this week. As always, shoot me an email and tell me what you need help with. Last week I ended asking you about your avatar. There’s endless data available to get super nichified (think I just made a new word). So, who is your ideal client? When you know that, it’s so much easier to create useful content. For instance, if you prefer affluent working moms as clients, there’s a free infographic from Scarborough (Nielsen Local).